SIMMER-III (SIMMER-IV) is a 2D (3D) fluid-dynamics code coupled with a structure model and a space-, time- and energy-dependent neutron dynamics model (TWODANT/ THREEDANT/ DANTSYS). The computer code SIMMER-III is developed by JNC (Japan nuclear Cycle Development Institute, O-arai Engineering Center) in cooperation with Forschungszentrum Karlsruhe (FZK), CEA (Commissariat á L'Energie Atomique, CEN Grenoble and CE Cadarache) and IRSN (l'Institut de Radioprotection et de Sûreté Nucléaire). Recently PSI (Paul Scherrer Institute), SCK-CEN (Studiecentrum voor Kernenergie-Centre de D'Etude de L'Energie Nucléaire) and ENEA (Ente per le Nuove tecnologie, l'Energia e l'Ambiente) joined the SIMMER cooperation. The fluid-dynamics part of the code can be run independently from the neutronics module. Two liquids and a gas field can move separately and are interfaced with the necessary momentum-, heat and mass transfer functions. The numerics of the fluid-dynamics module utilizes a 2nd order difference scheme in space and time. The physical time scales the code has to describe range from 10-7s to minutes and the space scales range from 10-7 m to a couple of meters. One of the features of the code is the tracking of interfacial areas with their respective sources and sinks. Pool and channel flow regimes are treated. The code utilizes an elaborate equation of state (EOS) system, describing fuels, steel, various coolants (sodium, lead, water), gases and simulation materials in their solid/liquid and gaseous states up to the critical point. With the structure model, real structures (pin, hexcan, vessel) but also ‘virtual’ structures with ‘special’ qualities can be modeled. 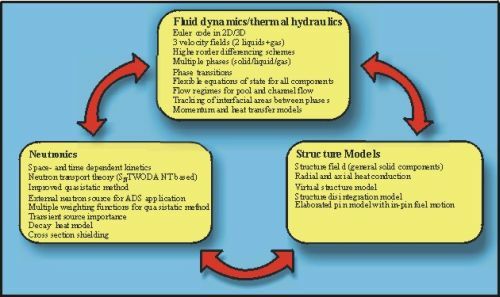 The fluid-dynamics part of the code is designed in a very general way; it is not restricted to the simulation of accident phenomena in reactors and can be run independently from the neutronics module. The neutronics module provides nuclear heat sources based on the mass and energy distributions calculated by the other code elements. The transient neutron flux distribution is calculated based on the improved quasistatic method. For the space dependent part, a TWODANT based flux shape calculation scheme has been implemented recently. The decay heat is taken into account separately. For ADS application a time dependent external neutron source with a space-energy distribution defined by the user has been integrated into the kinetics equations. The fluid-dynamics and neutronics equations are usually solved on different meshes giving the necessary flexibility and fulfilling accuracy conditions.